The element that distinguishes Shoubun vinegar is the conception/idea behind the process of the ancestors which has been transmitted from father to son from generation to generation, which only descendants of the Takahashi family know. In the process of vinegar production that we have been taking over during these 300 years there were also moments in which we perceived and felt a delicate change of climate but we never stopped giving our best. 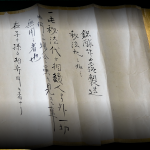 We wanted to transmit the recipe found at the end of hardship in the family tradition of the ancestors who have written it and left it to us wholeheartedly. The aim is to try to reduce even if just a little bit the difficulties and the challenges of this business for the descendants in a spirit that hides parental love. Producing good vinegar is like raising a child, you can’t take your eyes off them or do a shoddy job. From raw materials that have been blessed with nature’s richness to a production of brown rice vinegar following the traditional recipes, the secret of the success. The ingredients for the production of organic brown rice vinegar are three: rice, water and koji. It’s extremely simple. But especially for this reason the good or bad quality of the raw ingredients inevitably comes out in the taste of the vinegar. For the production of organic brown rice vinegar, rice is procured from organic farming of farmers from the Kumamoto area for example, so of course the rice doesn’t go through chemical process and no industrial fertilizers are used and also since the water and the surrounding ambient is not polluted as well, the rice simply absorbs in its original taste the influence of the nature in which is grown. And specially because of this straight forward relation in which farmers and the producer know each other personally, sometimes we visit the farmers and it is possible to check the farming methods directly. The stocking up of the brown rice vinegar occurs two times a year, in spring and fall, before and after the equinoctial week. The brown rice is steamed, koji is added and everything is mixed together. Then we mix the steamed rice with koji in a pottery vase in which it has been added water. We shake the koji and make it float on the surface of the liquid. The vases for the preparation of vinegar which are half buried in the ground are vases of big dimension that have been produced since the past. These pottery vases absorb the solar heat and stimulate and quicken the fermentation process. The lids of the vases are made of paper, which has been spread with funori and persimmon juice. On the lids the year, month and day of the stocking are written in vivid handwriting ink. The young vinegar that has safely completed the three months process of static fermentation and finally approaches the final step of maturation and aging in storage tanks. The vinegar that has been started to prepare just before or after the autumn equinox day enters the aging phase as the winter temperature severely continues to cool down, on the other side for the vinegar that is prepared just before or after the spring equinox day the temperature begins to rise up. The saying “no heat or cold lasts over the equinox” still exists and it’s used in the vinegar production world. At Shoubunsu during the year various types of table vinegar such as pure vinegar or brewed vinegar are brewed. But this manufacturing method is of course a conscious process that requires time for fermentation and aging. The important maintenance of bacteria happens similarly with the brown rice vinegar. The fermenting process is made inside a Japanese traditional kura storehouse which is more than 80 years old. It is put inside fermentation tanks and in a wood bucket of 3000 liters and here it slowly spends time. The vinegar in the middle of the process of fermentation corrodes metals, to the utmost tends to be avoided the use of metals in the construction of warehouses and wood barrels. Also, inside the warehouse there is nice breathability, in the summer is fresh and during winter is warm, so the temperature stays stable and under control during the whole year. Nevertheless, the vinegar artisans watch over the developing of bacteria and make efforts to stimulate their movement. If the temperature severely goes down, they roll a woven mat over the wood barrels so as to cover them with a blanket, if the temperature increases too much, they open the door of the warehouse. They are constantly worried about “the development of the vinegar”. Our motto is, without rush, not seized by the thought of the immediate visible result. There is also another reason for which the fermentation process is made to happen in this old kura warehouse. In this warehouse which has passed through various eras it has come to live the bacteria which is called “the bacteria of warehouses” and its presence can be found without doubt in warehouses of the origin of the production of vinegar and in old sake breweries, in other words, the “mother” of the modern bacteria. The bacteria is what develops the vinegar and gives it a round taste. From the fermentation cellar/kura warehouse it passes trough the storage tanks, and it becomes vinegar that has an aroma and an acidity that has settled in a light amber colour. The artisans check the color, the taste and the aroma, at the base of a severe product quality control, finally it passes through the final steps of filtration and sterilization and it becomes the final product as a good. Compared to the fast brewed vinegar it takes far more labor and time, but still this method has gone through 300 years without changing. Of course many modern technologies have been introduced, such as the control of temperature but still the basic method of production has been maintained the same since the ancient times. But this is because we strongly believed that nothing cannot be produced in a hurry. Rather shoubunsu is proud to still be at the antipodes of that “fast producing” conception.